Boehringer Ingelheim has expanded access to a digital adherence programme that helps COPD patients take their medicines as prescribed by offering them educational and motivational tools. A collaboration with HealthPrize, RespiPoints is a free mobile and web-based programme that’s open to patients in the US who take one of three Boehringer medicines for COPD – Stiolto Respimat, Spiriva Respimat or Spiriva Handihaler. The move follows a nine-month pilot that saw 84% of participants confirm they followed RespiPoints’ tips on exercise and nutrition, and report an 85% decrease in gap days between refilling their next prescription. Those enrolled in the digital adherence programme can take part in activities, such as reporting they’ve taken their medicine each daily or verifying they’ve refilled their prescriptions, in return for points that can be redeemed for e-gift cards. Jean-Michel Boers, human pharma president at Boehringer Ingelheim Pharmaceuticals, said: “We strongly support the role of innovative health technology solutions in respiratory treatment plans to help improve healthcare outcomes. Results from the pilot were presented at the recent 2018 DTC National Conference in Boston. There attendees heard that 56% of participants remained active in RespiPoints over the entire nine-month pilot period – compared to a 9% average engagement rate for health apps in general at the nine-month mark. Participants in the digital adherence programme visited the RespiPoints website an average of 4.6 times each month, spending an average of 50 minutes there per month. 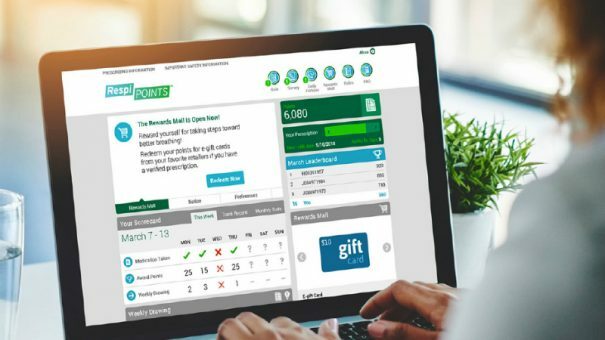 Tom Kottler, co-founder and CEO at HealthPrize, said: “The results from the RespiPoints programme confirm the value of the HealthPrize platform to enroll and engage people who may need additional support to better understand and manage their health.